Cuddon has been involved in lyophilization technology and the design and manufacture of lyophilization equipment since the early 1960s. Cuddon is extremely proud of the international reputation it has gained in this time. Lyophilization technology is the science behind the process commonly known as freeze drying. Lyophilization is the removal of moisture from a pre frozen product under a vacuum without passing through a liquid stage (sublimation). Correct implementation of lyophilization technology will result in a final product with a final moisture content of between 1-2%. Correct implementation of lyophilization technology simplifies aseptic handling and enhances stability of dry powder, without excessive heating of the product. Other advantages of using lyophilization technology include the rapid dissolution of the reconstituted product, lyophilization preserves biological activity along with structure, general colour and taste. Lyophilization also results in extended product shelf life and nutritional value. Cuddon General Purpose Lyophilizers range from 18kg to 1500kg condenser capacity, with shelf temperature ranges from +70 to -35 deg C and a ice condenser temperature as low as -55 deg C.
The test criteria for the Cuddon General Purpose Lyophilizator equipment is to sublimate the condenser capacity of ice in 24 hours. The implementation of lyophilization technology is well suited to most products which contain moisture. Although implementing lyophilization technology is costly and the equipment complex, the process and finished product is generally considered to be of superior quality and high value return. 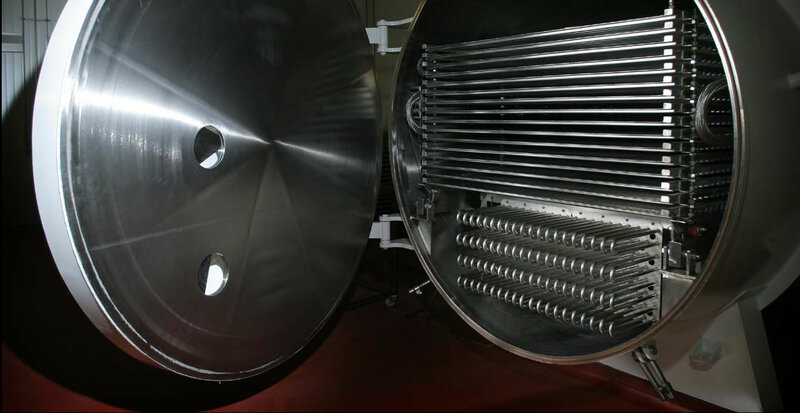 Discover more about the how Cuddon have implemented lyophilization technology to gain an international reputation for manufacturing world class freeze drying equipment.